As Arsenal prepare to face Liverpool this weekend, they can do so safe in the knowledge that their €20 million investment is paying off. Danny Welbeck, lured from Manchester United on transfer deadline day (following a late plea for extra time) has slotted into a starting XI bursting with pace and power. Liverpool, meanwhile, have a problem with their own €20m investment. Mario Balotelli, signed from AC Milan, has struggled under the burden created by a Luis Suarez-shaped void at Anfield. Arriving in England off the back of less-than-glowing reviews in Italy and his agent even proclaiming that this was his “last chance” to prove his worth, Balotelli has roundly failed to re-adjust to Premier League life. Never a prolific striker, Balotelli is yet to score or assist a goal in the league for Liverpool, with his form for the Reds reminiscent to that of his final season with Manchester City when he notched just once before a mid-season move to boyhood club Milan. Balotelli has cut a forlorn, frustrated figure at Anfield, with his apparent lackadaisical approach in sharp contrast to that of Suarez. The Italian has created just seven chances for team-mates from open play this season – full-back Alberto Moreno, in comparison, has created twice that amount while Welbeck has created 25. With Alexis alongside him in a Gunners line-up that has scored 28 league goals, Welbeck’s profligacy – he has scored three times and averages a goal every 387 minutes – can, to some extent, be forgiven. He was never prolific at Old Trafford, but he has proven that he can play an integral part in a top team. And while Welbeck has regularly brought others into play, Balotelli has often looked isolated. 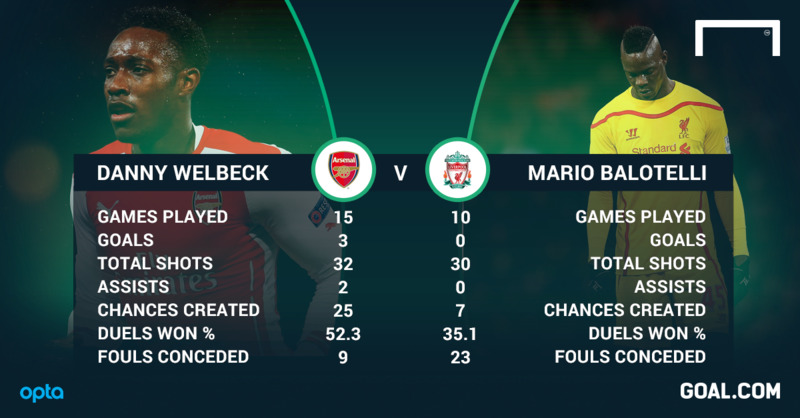 Often picked as a lone striker, Balotelli’s role is arguably more important than Welbeck’s; he is the focal point and must involve his team-mates. With no assists and no goals, he is doing neither. With 30 shots to his name, Balotelli has tested the opposition goalkeeper 16 times – the same number as Welbeck – but his inability to work with those around him, including the likes of Raheem Sterling and Steven Gerrard, suggests selfishness. While that trait has resulted in spectacular goals earlier in his career, it is getting him absolutely nowhere at Anfield, where just last season Luis Suarez, Daniel Sturridge and Raheem Sterling were working in perfect harmony. His passing statistics, too, are poor. Balotelli completes, on average, 21.82 passes per 90 minutes with an accuracy of just 71 per cent. Welbeck, meanwhile, completes 28.61 with a completion rate of 85%. Welbeck also offers the threat of a turnover, having managed 15 interceptions this season, or one every 75 minutes, to Balotelli’s two, or one every 365 minutes. The Arsenal man has won 52.3% of his duels to Balotelli’s 35%. Those words are in stark contrast to Wenger, who had nothing but praise for Welbeck when quizzed on the details of the deal that took the striker from Old Trafford to the Emirates, describing him as an “ideal signing” for the club. Wenger knew what he was getting with Welbeck and has seen him settle quickly in a team requiring precision and accuracy, while Liverpool appear flummoxed by Balotelli’s struggle to click. And they simply do not have the reserves to allow this to go on. He was never likely to be able to replicate the superhuman heights that Luis Suarez reached in 2013-14 but many hoped Balotelli could at least settle down quickly and start scoring. He now has a job on his hands to reach double figures. With Suarez and Sturridge in their pomp last season, Liverpool had hit 34 league goals by December 17. This year, with Balotelli and Lambert floundering, they have scored 16. Arsenal, by comparison, are returning to the form that many expected of them at the beginning of the season and have scored eight goals in their last two competitive outings – 4-1 thrashings of Galatasaray and Newcastle – with Welbeck a key player. Balotelli’s struggles, meanwhile, were summed up against Manchester United last weekend. His appearance from the bench was a promising one – returning from injury, he put in arguably his best performance in a Liverpool shirt, only to be denied time and again by the brilliance of David de Gea – but it was another case of so close and yet so far. Twenty-four hours prior Welbeck was laying on an assist as Arsenal thumped Newcastle and the England international appears, already, to be an important part of Wenger’s plans. Balotelli, though, now faces a battle to even make the Liverpool starting XI. He has precious little time left before the January transfer window and if he does not start producing soon, he may well find his days numbered. In a battle of two €20m strikers, so far there is one clear winner.